As of this month, it’s been 40 years that I’ve been reading and writing about atrocities committed in the name of “choice”; i.e. abortion. You can’t get into this fight without seeing ghastly images and situations, but you’d think, after four decades, nothing would surprise me anymore. Not true. And I see this as a desperate attempt by pro-abortion activists to regain lost momentum in the battle for the conscience of our nation. A couple of recent events have reminded me just how deeply the abortion culture debases and degrades women—the very women it pretends to champion. On March 30, an Indiana court sentenced 33-year-old Purvi Patel to 20 years in prison for allowing her baby to die. She induced her own abortion last summer using drugs she illegally ordered online. She was 25 to 30 weeks pregnant—a few weeks short of full term and well past viability. Patel then tossed the baby in a dumpster, wrapped in a bag. Evidence showed the baby was born alive. She would have gotten away with it, but Patel bled so badly she had to go to the emergency room. She claimed to have miscarried, but the truth came out. She was convicted of felony child neglect, feticide and the illegal online order. That’s horrific enough, but the blatant lies promoted by pro-abortion media and organizations take it to a new low. They’re trying to portray women who abort their babies late in pregnancy as the victims by ignoring inconvenient facts of the cases. A Huffington Post writer also took up the lie and warned of dangers when “political ideologies rule over women’s bodies.” Somehow the pro-death crowd is blind to the dangers of its own ideology: 57 million dead babies and countless wounded women. 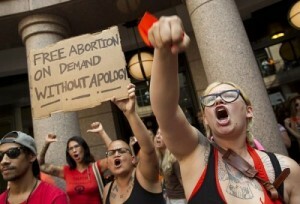 How blinded are some women by the abortion industry and feminist elites? The day after Patel was sentenced, Kimberly Pappas gave birth to a son in the restroom—in the toilet—of the Detroit business where she worked. She allegedly wrapped the baby boy in a plastic bag, put the bag in her desk drawer and, incredibly, went back to work. Coworkers called 911 after finding the bloody mess in the restroom. The baby was found, his tiny body still warm. Pappas also claimed miscarriage, but the medical examiner reported the boy was born alive and died by asphyxiation. She’s been charged with felony murder, first degree murder and first degree child abuse. It’s nearly impossible to imagine—a woman sitting calmly at her desk while her own son suffocates inches away. Abortion doesn’t empower women; it enslaves them. Imagine the grief and shame Purvi Patel and Kimberly Pappas will likely suffer when the full reality of their actions comes home to roost. It won’t be pro-abortion activists who help them pick up the pieces of their lives. It will be those like you and I. Life Issues Institute has formidable foes throughout the world who victimize women and their babies. Our love for them compels us to fight against such attempts to demean them. Visit our website to learn the truth of abortion and its aftermath—and get involved! This entry was posted in 2015, Infanticide, Late-Term Abortion, The Latest by Bradley Mattes. Bookmark the permalink.